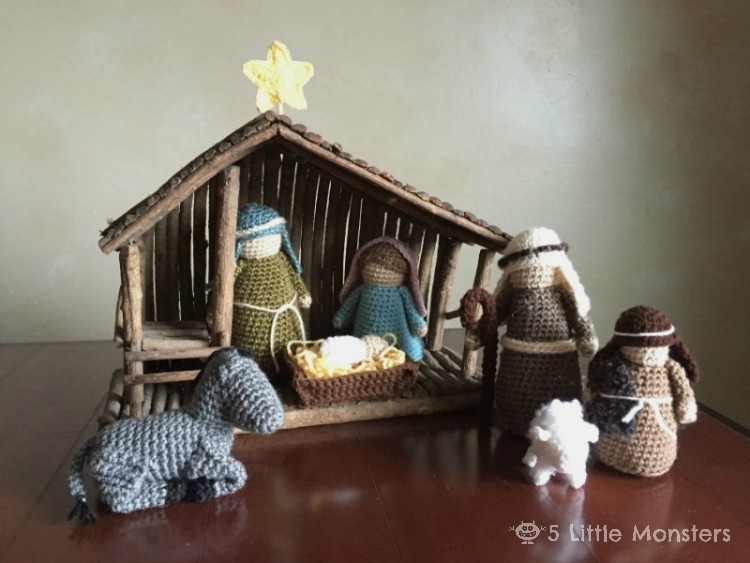 This Crocheted Nativity Set is probably one of my favorite things that I have made. I really love the way it turned out. When I was trying to think of what I could make for the finale of So You Think You're Crafty I went back and forth on what kind of project I wanted to do. I thought about making some kind of quilt or something but every time I thought about it I kept coming back to crochet. 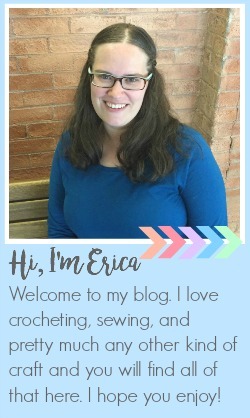 I feel like although I enjoy sewing and doing other crafts, crocheting is the most representative of me and of my blog. I have more crochet patterns on my blog than anything else, it is what I spend the most time working on and I just felt like it was the craft that would really represent me as a crafter and as a blogger and I really wanted my final project to be me in a project. I love nativities and since it is almost Christmas time I decided that it would be really cool to make one. When I finished making it, I felt so happy with what I had made. It wasn't about winning or losing the competition, either way I had made something that I loved and I was happy with that. Feeling that way made me feel like I had succeeded in what I wanted, I had put myself in a project. When I found out that I had won I was really excited and happy, I am still sort of in shock about it. When I first started out I told my husband that I really just didn't want to be the first one to go home. The longer I stayed in the more I wanted to, and thought that maybe I could, make it all the way. Making it to the finale felt awesome, winning was really great. Anyway, enough about that. We should probably get on to the details of the pattern. It is kind of a big project so this is going to be a long post. When I was making the Nativity I started out with Mary, Joseph and Baby Jesus. I figured they were the most important and needed to be there. Then I figured I would add as many more figures as I had time to. I ended up with two shepherd, a sheep and a donkey. I think I will add some Wise Men at some point but I wasn't worried about getting them done right away. 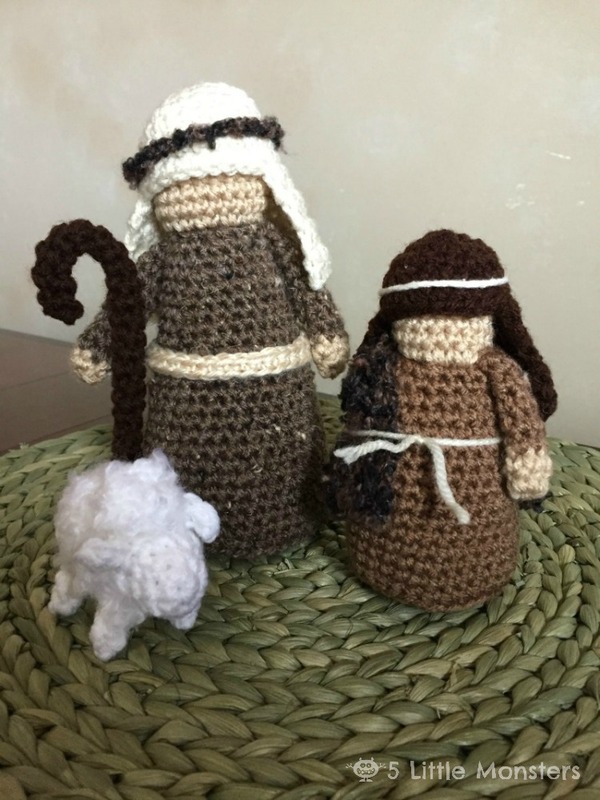 All of the figures are made with worsted weight yarn with the exception of the sheep's body, which was a bulky yarn, and the boy shepherd's shawl thing. I used lots of different brands and colors of yarn and I'm not going to list them in the pattern because really, you can use anything you have. You don't need a lot of any of the colors so if you have some little balls of leftover yarn in your stash you can use that. If you have questions about specific colors, feel free to ask me and I will let you know. Most of what I used was Red Heart Super Saver, Lion Brand Heartland, and Vanna's Choice. There was a little bit of Joann's and Michaels' store brands in there too. The stable in the pictures is one that I borrowed from my mom. She found it at a thrift store a few years ago and worked perfectly with my set. *Shawl is worked back and forth in rows, not in the round, even though you still start in a magic ring. Finished size about 3" x 5" x 1 1/2"
Finished size about 2 1/2" x 4 1/2"
I hope you enjoy this pattern as much as I have, if you have any questions let me know and I will try to help as much as I can. So wonderful!!!! I know this took time, creativity, and work. I appreciate so much that you've made this set free. It is beautiful. Darlene P.
Thank you. I hope that you are able to use the pattern to make your own. 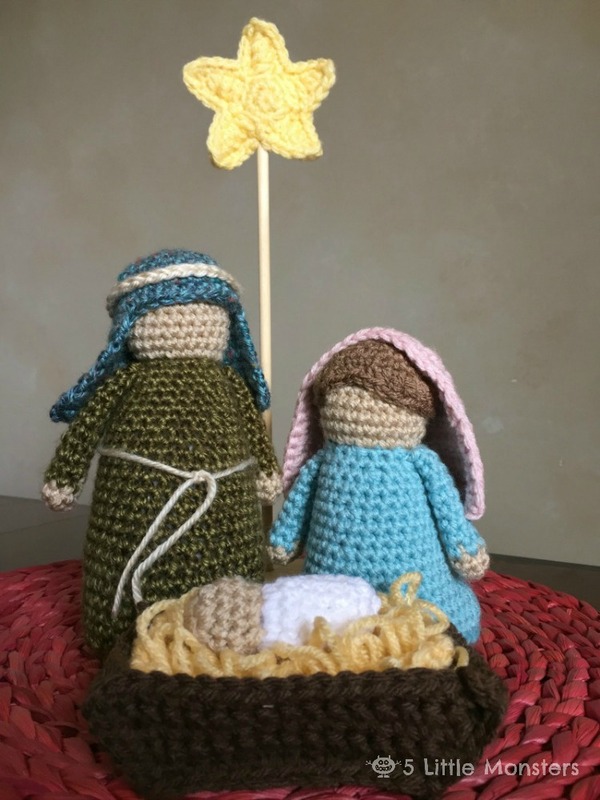 I'm with you, I love crochet and nativities. My daughter-in-law's mother is a crochet wizard and helped her make a smaller set for me a few years ago, but she didn't write it down. It must have taken a long time to figure out the final pattern. You're so generous to offer it for free. Thank you! You're welcome. It is something I have always wanted to do so I was really excited to make it. This is beautiful! I have been looking for a pattern for quite a while now; THANK YOU!! I am new to crocheting (novice; just learning this year-mainly self taught with help from another new crocheter). My favorite thing about Christmas is the Nativity. I have collected small sets from different places I have traveled to in addition to one that I painted for myself 31 years ago-my first Christmas as a 'grown up'. Thank you for sharing this with all of us. Someday, I hope to be ready to design/write my own patterns. In the meantime, I appreciate all of you who generously share yours free. Its what keeps me loving the craft and searching for more challenging projects. Thank you, I love nativities too. I am really excited to be able to put this one out this year. I hope that you are able to use the pattern to make your own. If you have any questions feel free to ask and I will try to help. I go back and forth sometimes on selling patterns versus offering them for free and I always come back to offering them for free because before I started making my own patterns I always appreciated being able to use other people's free patterns. I couldn't really afford to buy patterns so I used the ones I could find for free. I feel like sharing my patterns is kind of my way of paying that back. Getting comments like the ones here make me feel like I am doing the right thing. I am sure that there are other people in that same position of wanting to try new patterns but not being able to afford to pay for new patterns all of the time. The way that I got to the point of creating my own patterns was by making patterns made by other people and learning the techniques and eventually I understood the construction and shaping process well enough that I could make my own designs. Do you sell the finished nativity? Love it but I think I couldn't make it. This is so unique- love it! Does the mr stand for main row? I think you did a great job. I love it. It stands for magic ring, sorry, I probably should have written that in the pattern. You start most of the pieces with a magic ring or magic circle. Alternatively you can chain 2 then work the single crochets in the first chain. Thank you so much for the pattern. I can't wait to get started. Beautiful...I'll have to see if our amazing grandma can make us one! Thank you for sharing the true Spirit of Christmas! i have a question on the donkey pattern. when working on the body rows 5-17 are 24 stitches but on row 18 it says sc in each and only says that it's 18 stitches. am I missing something? What is a weighted base? /What is it made of? I explain how to make it in the pattern for Joseph, basically it is just a circle of fabric gathered around the edges and filled with weighted stuffing beads. The ones I use are from Fairfield World and they are called Poly-Pellets. I will add a link in the pattern. I pull the circle closed and it creates a little, almost like a beanbag type thing, that I put in the bottoms of the figures. The added weight at the bottom really helps them stand up better, at least I feel like it does. We are making this now and are really struggling with Mary's shawl... it seems to make a sort of cone shape instead of what I thought it would make... any chance there is a minor error in that part of the pattern? I think it is written right. Are you joining or working in rounds? The shawl is worked in rows. You make your first 4 sc in the magic ring then ch 1 and turn working back across those stitches. To start out it should create a sort of semicircle shape. I was working in circles so I will try that and hope for the best! Thanks for the help! Not right now, maybe next year. This looks like a great fun pattern. 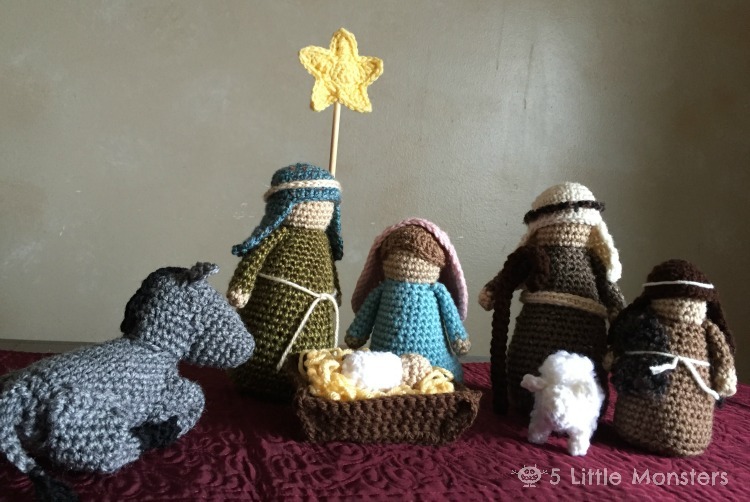 I collect nativities and love to crochet, so I'm happy when I can combine the two interests. Thank you so much for offering it for free! Is there a guide to your stitch abbreviations? I don't have one written down anywhere on my blog, I try to use standard abbreviations, ch- chain, sc- single crochet, dc- double crochet, mr is magic ring (I don't know if that is the most common abbreviation for that but that is the one I use), sc2tog- single crochet 2 together, blo- back loop only. I think those are all of the abbreviations I use in this pattern. Sorry for my ignorance.... What is a "magic ring"? I've been crocheting my entire life and never heard that term until now. What size hook did you use? I assume it was the same for every figure? I used a G hook for everything. such a fun pattern! thank you so much for sharing it! is there a pdf so we could easily print it off? I don't have a pdf right now. I will try to get one added this week, but in the meantime you can use the print friendly button at the bottom of the post and it will let you remove the sections that you don't want to print so that you can print only part of the post. I love this set! I just started on Joseph and am halfway through the body I think. I made the weighted base but what is the rest of the body stuffed with? Just the same poly beads or fiber stuffing? Thank you! Just regular fiber fill stuffing. I just noticed that I left that out of the supplies list, I will go add it in right now. This is wonderful!!! Thank you very much for sharing!!!!! Can't wait to get started!! Beatiful, thank you for sharing. These are awesome! I just finished making Joseph and Mary and Baby Jesus. My 2 yr old thinks they're the greatest things ever! Thanks for offering them for free! I was just looking at making the donkey, I think there is a small mistake, it was mentioned about also. The question is what is supposed to happen between rows 17 and 18? Just the standard stitch decrease? Thanks for noticing that and letting me know. Row 18 is a decrease row, I just typed it up wrong. I fixed it in the pattern so it should be right now. I seem to have made several errors typing up the donkey portion but I think they are all fixed now. I hope. I just wanted to let you know that your pattern is lovely. I can think of a few family members and friends who might be either getting a whole set or just Mary, Josef and the baby from me this year. Thank you so very much for sharing your creativity with the rest of us! Merry Christmas! Thank you so much for this free pattern! I love it! 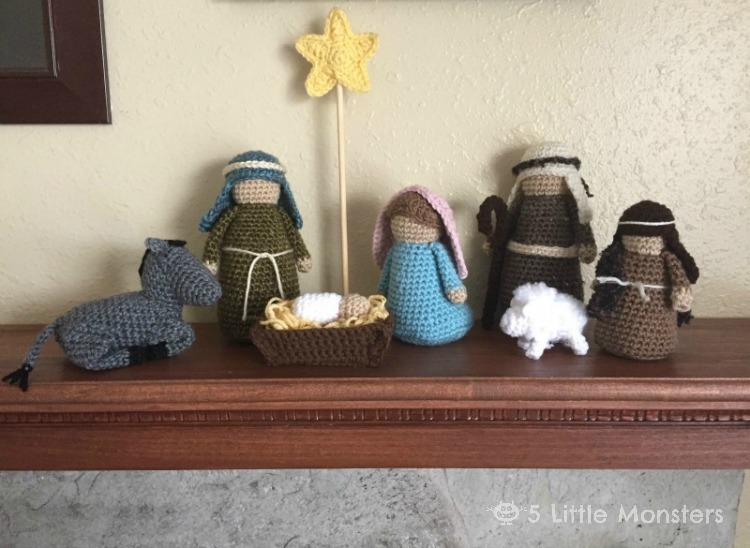 I love collecting Nativities and crocheted ones add so much! I love the classic look to this Nativity. I would make this as family Christmas gifts. Thank you again! Love it! Thank you. Thank you, thank yooooouuuuuu! This is amazing! Thank you so much for taking the time to make a pattern. I can't wait to start making a set this week! I hope you don't mind a couple of quick questions: is this written using American or English crochet terms as I know they are different (sorry haven't been crocheting too long and so not quite an expert yet)? Also do you know what a G hook is in mm? Thanks for this pattern ... I am excited to try it! Very generous of you to make it free... Thanks so very much! Did you slip stitch at the end of every row, or do a continuous round? Thanks for sharing! It is so cute! I'm so glad to have found this pattern. I want to make nativity sets for my neighbors and this is the first one I hav found that I think I can make several of quickly! Thank you for sharing. Thank you so much for sharing this pattern! I've always wanted a nativity scene and now I've made my own. The pattern was extremely easy to follow. You did a really nice job! This is amazing, thank you so much! Are you going to do wise men also? I guess they'd just be the same as Joseph etc, but maybe with bright colours? I will add some wise men but not before this Christmas. My plan is to make them similar to Joseph in brighter, more royal colors, and with some different headress options. You can, they just may not stand up as well. The weighted bottom really helps them stand up better. You could try using something like rice, or dry corn or beans, I know that is what some people use, the problem with those is that they could go bad especially if there is any moisture but it is another option. Sorry for all the comments, but can I sell the finished product? Sorry for the super late reply but yes you can. The only thing that I ask is that you acknowledge where the pattern is from, link to it if you are selling online. Other than that, sure, I have no problem with it. Can I save this on pintrest?? yes, there should be a pin it button that pops up in the top left hand corner of the picture and you can save it that way or copy the url and paste into pinterest and it can be saved that way. I am so EXCITED to make this!!! Thank you so much!!! 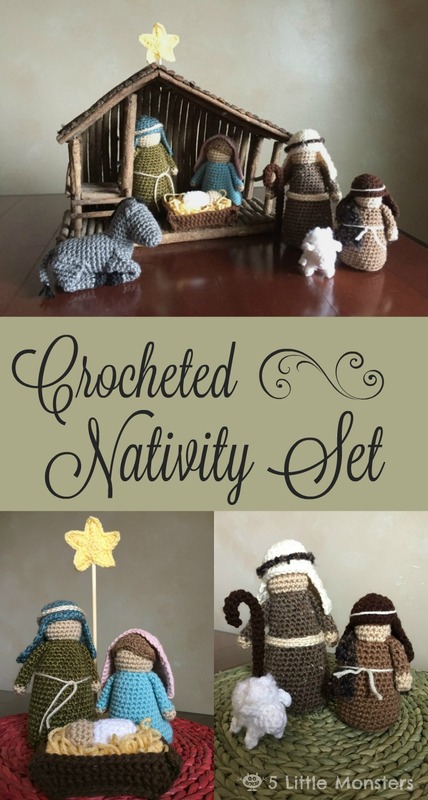 I love this and since I collect nativities it's about time I make one myself. Just curious if you ever made the wise men or camels. Thanks for the great patterns! 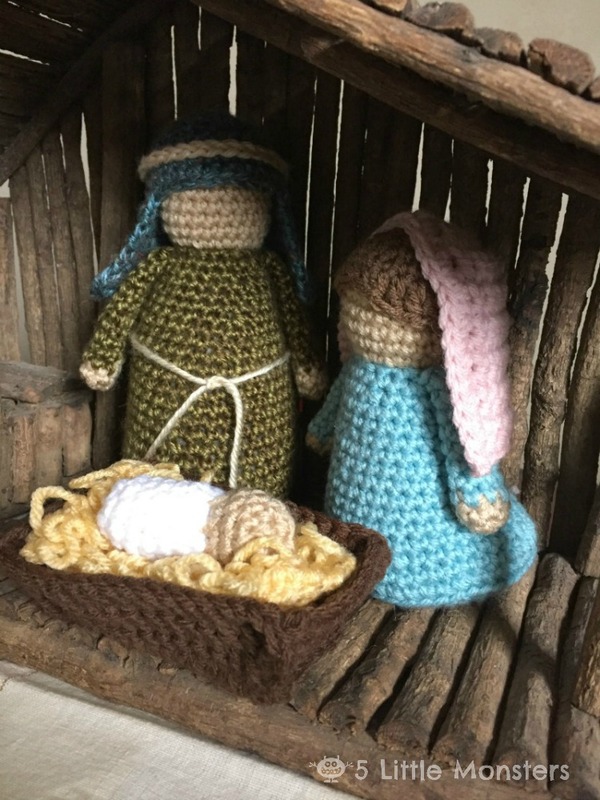 Thanks from Germany, i have finished joseph already and started crocheting Mary now. I am very excited to Show ist to my 2 year old and the whole Family. Thanks for this free pattern. Thank you! So kind of you to share them for free. I appreciate your time and effort. This is an adorable nativity and I can't wait to make it for my grandsons. About how big is the creche/stable you got from your mom? I wanted to order one but I have no idea how big I'll need, how big the figures will end up in the end... Thanks! I just finished Joseph using Vanna's Choice yarn and a size G hook and he is 5" tall rather than 7 1/2". I went back and counted my rounds and there are 39, just like the pattern calls for. I'm curious about that. I didn't think I crocheted that tightly! lol... Actually, I'm quite happy with his height. I almost decided to eliminate some rows because I wasn't sure I wanted him to be as tall as 7 1/2"! 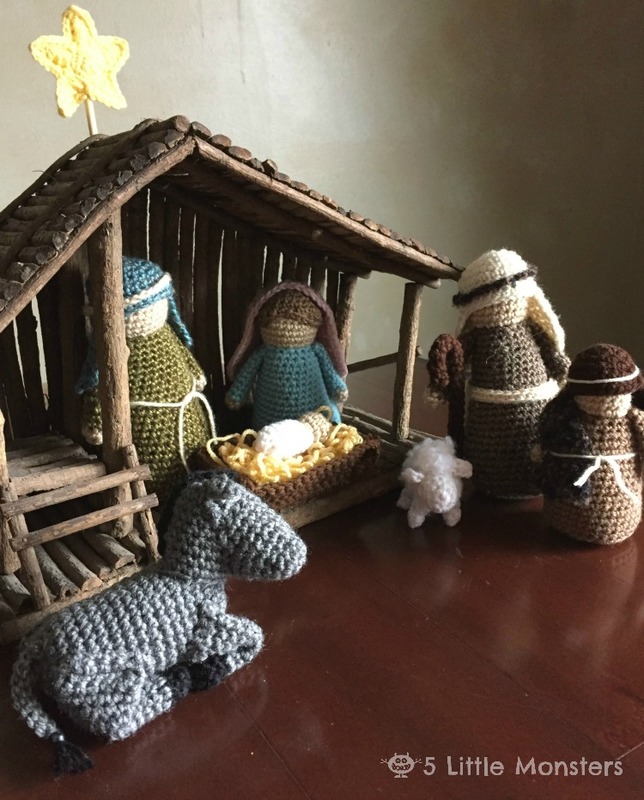 I crocheted a Nativity set waaaaay back in the early 1980's (I think) from a pattern I found in a Family Circle magazine. I located the pattern on Ebay last year and was thrilled to have found it but it's nowhere near as nice and as easy to follow as your pattern. Thank you again for freely sharing your patterns. You are very generous. I collect Nativity sets and can not wait to make this one. Love it! Am I blind or is anybody else missing the pattern for the sheep's head? I'm also struggling to get the sheep right - I think the first 9 rows, where it says to use the non-textured wool, is meant to make its head. But mine doesn't seem to poke out enough to look separate from the body. I have a sister in law who collects Nativity sets. I will do my darudest to get it done in time for her December display. She displays one a day until Christmas. Thank you for shsring. I crochet a circle the same size as the bottom of the figure and cut a piece of plastic the same size and sandwich them together. This makes a solid base and the figures will stand up without any problem. Thank you so much for this set of patterns! I am going to try these for sure. So perfect for what I was searching for! Did you design wise men to go with this set?